We all have been there. We set goals, we dream about them, and we feel good about them, but we just don’t follow through. We lack the accountability to make things happen. And this, my friend, is one of the main reasons people fail to reach their goals. When you don’t hold yourself accountable for your goals, most likely, you will never do anything about them. When there is a choice to choose between watching the TV or running, you’d choose to watch the TV. This is why most people choose to spend time on social media and play games rather than spending time building their blogs or business. They prefer to do the easy things that are fun than to work on their goals that may not be fun at the moment, but the future reward is great. This is what happens when people lack accountability. When you don’t have the accountability, you become less committed. And we all know what happens next. We choose to procrastinate on our goals. We delay the work that we are supposed to get done. We choose to put our goals and dreams to a later date. 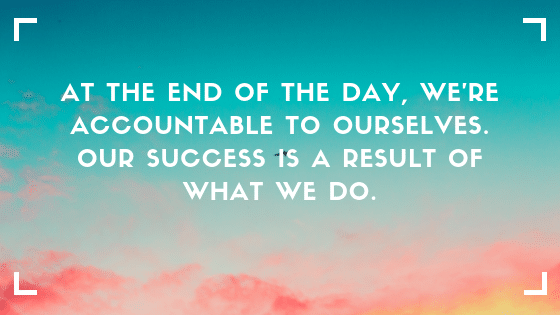 There is a reason why we all hate to hold ourselves accountable. It is human nature that we care about how others look at us. We hate to hold ourselves accountable because we don’t look bad in front of others. Think about it, if you share your goal with others in the room, but at the end of the day you fail to reach your goal, you’ll feel embarrassed. This is why we don’t commit. This is why we hate being held accountable. But the truth is that without being accountable for our goals, we will never achieve them. When you put yourself accountable, you are making the decision and telling yourself that you will accept nothing less than what you have committed. You are telling the world and everyone else that achieving your goal is priority number one. In other words, you are putting yourself on the line. You know that when you share your goal with someone, you are making a public commitment. However, this feeling can also work as a drive to motivate you to work harder, to commit, and to do whatever you can to reach your goal. Ever wonder why most successful businesses started with partners or friends? Steve Jobs started Apple with Steve Wozniak and a bunch of other friends. Phil Knight, the creator of Nike started with his running coach, Bill Bowerman. The same thing goes to Microsoft. In 1975, Paul Allen was the one who initiated the idea of Microsoft to Bill Gates. You must hold yourself accountable if you want to achieve extraordinary success in life. Without someone or some kind of a system to ‘monitor’ your progress, you will never do it when things become tough. For example, you have committed to getting up at 6AM and workout in the gym by 7AM tomorrow. But when the alarm goes off at 6AM, you get up and it is raining outside, what will you do? Most people will choose to continue to sleep because it is too tempting to leave their comfortable bed. But if your coach is waiting for you in the gym, do you think your chances of going to the gym and actually workout will greatly increase? Don’t just say that you want to achieve your goal, create a work schedule or a plan to get there. You must state it clearly how to do it and when to do it so that you can give your mind a clear instruction of what needs to get done. There was a flu shot study done by researchers and they discovered that when people wrote down the specific date and time when they planned to get their flu shot, they were more likely to follow through. Thus, don’t just say that you want to lose weight and exercise more. Create a plan. Make a schedule. State it clearly when and how you’re going to do it. I will workout in the gym for 45 minutes every Tuesday and Thursday from 8AM. I will write a 1,000 words article for my blog every day, at 9AM. When you state out your intention clearly, you are giving your mind a specific instruction of what you need to do. And when the time comes, your mind will remind you and put you into action. Like I said above, almost all successful people started with someone else. They don’t do it alone. This because when you have someone to work together on a common goal, not only that it is more fun, but you can motivate and encourage each other when the tough times come. So, who is your partner? Who is the one that will support you, encourage you, and motivate you to continue to make progress to achieve your goal? Now, your accountability partner doesn’t need to be someone knowledgeable or someone who is more successful than you, he can be anyone as long as he is willing to support you and hold you accountable on your progress. If you’re a solopreneur like me, get a close friend or your spouse to be your accountability partner. According to a study done by Dr. Gail Matthews, those who write down their goals, commit to an action plan, and share their weekly progress with someone else, are 76% more likely to achieve their goals. Hence, share your weekly progress with a partner. If you are serious about achieving your goals and making your dream a reality, find yourself an accountability partner, now. Another way to make sure that you hold yourself accountable for your goals is to get yourself a coach or a mentor. If you look at the sports industry, every successful athlete has a coach or sometimes many coaches. 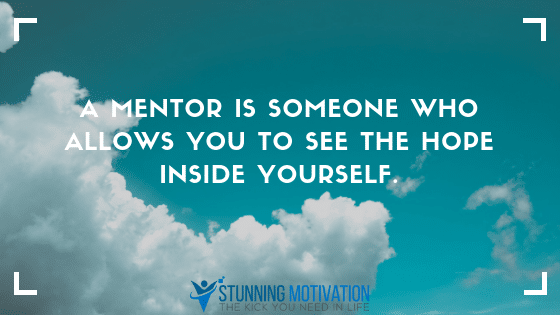 Your coach or mentor does not only put you accountable, he or she can accelerate your success by identifying your weakness and strengths, and also helping you focus on the right things to do. You can get clear with your goals and what you really want to achieve. You are able to identify the blind spots and produce better results. You become more accountable because your coach will keep you on track. You become better as your coach train and build you into the right person worthy of success. You boost your engagement with your work and feel happier. So, if you are able to get a coach or a mentor to guide you and hold you accountable, by all means, do so. And if you have no idea where to start, read this article. How often do you review your goals? When was the last time you look at your goals, visualize their achievement, or write them down again? We all know that success doesn’t come to us accidentally. It is by designed. And one of the most important keys to success is to program your goals into your subconscious. You want to constantly think about your goals. You want to make your goals a part of your life. Remember this, when your goals are out of your mind, you will never do anything about them. You can never take action and act on something that is not in your mind. Therefore, you have to consistently condition what you want into your mind. This is why you have to review your goals and write them down on a daily basis. It’s easy to understand, you don’t want to lose your focus on your goals, right? Then you must review them constantly. If you want to improve your free throws skill in basketball, what will you do? You practice it every day, right? The same goes for holding yourself accountable for your goals. You review your goals daily. You remind yourself of what you need to do until it’s not an option not to do it. You make your goals your #1 priority by giving it the focus they require. 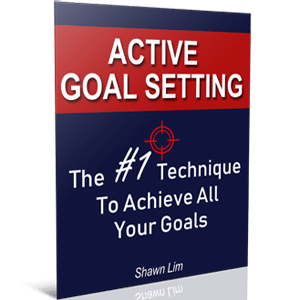 And if you want to know how to review your goals on a daily basis, read this article. Do you know that the environment you’re in can hold you accountable as well? When you switch your environment, your mood changes too. Like when you get to the office, you’ll know that it’s time to work. But when you get back home, you’ll put yourself in a more relaxed mood and you don’t want to talk so much about your work. This is why people go to the gym to workout. They know that it is difficult to workout in their house, even if they have all the equipment. When you change to your sports attire and get in the gym, you see many others are working out there. The sound of and the environment boost your drive to want to exercise and sweat. But when you’re at home, you feel less tense. There’s a comfortable couch and the TV is there. These triggers make you want to procrastinate and distract you from exercising. So it is obvious. If you want to hold yourself accountable for your goals, create an environment that will support you. I find it difficult to work at home and this is why I get myself a co-working space. When I’m in my office, I see many others are working hard. And it makes me want to join the league and work hard too. One of the best ways to maintain your momentum and to boost your accountability is to create a measurement and tracking system for your progress. You see, if you want to lose weight and you commit to exercise every day, but if you’re not measuring your weight and you can’t tell if you are making any progress, you will soon lose the momentum. When you don’t know where you stand or if you are making any progress, you are not holding yourself accountable. So, create a big scoreboard to measure your progress. When you can see your performance and you know whether you are winning or losing, you turn the competition on. Plus, when you put up a scoreboard, you are letting others see your progress. There will be no hiding. People can tell if you are working on your goals or not. People can see if you are making progress to reach your goals or not. This is why having a scoreboard to measure your progress is important. Read my article here to learn how you can create a personal scoreboard. Imagine playing a basketball game without knowing the score. You can’t tell if your team is winning or losing. What do you think will happen? You’ll quickly lose the motivation to want to win. You’ll never know if you are making progress. A match will quickly become a practice. There will be no game because there is no accountability at all. So if you want to win at the game of your goals, make it a competition. Create a scoreboard, measure your results and track your progress, got it? Imagine when you’re in your schooling days, you hate to do the homework, right? But you’d still submitted your homework before the deadline, most of the time, right? Why is it so? Well, the deadline is definitely one crucial factor that helps you get the homework done on time, but there is another more important key that holds you accountable – the punishment. In school, children do the homework to avoid punishment. At work, you complete your task so that your boss will not screw you. You’re motivated to do the work because you want to avoid the pain. And at the same time, you can feel driven to do the work because you enjoy the pleasure. For some people, they’d do the homework because they love. They are able to wake up early and exercise for an hour every day because they love it. You’re doing things to either avoid the pain or to gain the pleasure. Hence, what you can do is to create a challenge and put yourself in a situation that you must win. For example, make a bet with your partner that if you fail to follow through to achieve your goal, you’re going to give him $50. If you fail to write 1,000 words before lunchtime, you will never have the lunch break. Instead, you will have to work on the article until it is completed before you can take your lunch. If your goal is to lose 10 pounds, make it a bet that if you fail to achieve the result, you will go vegan for 10 straight days. These are just examples. The point is that you want to put yourself in a situation where you cannot retreat. You want to build up the accountability so that you will commit and do whatever it takes to achieve your goals. Without accountability, there is no way you can achieve greatness in life. If you want to produce outstanding extraordinary results and achieve all the goals that you set, hold yourself accountable. Use the 7 methods above and create a life worth living. Yes, it may sound harsh and difficult, but that’s the price that you’ll have to pay. I believe that you’ll have to work on something in order to achieve it. There is no way you can accomplish your goal without putting in any hard work.